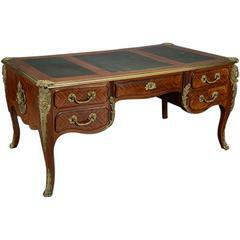 Spectacular mid-19th century French Louis XV style Sèvres and bronze mounted Kingwood veneered bureau plat with leather top. The rectangular moulded top with inset tooled maroon leather writing surface within a finely decorated gilt bronze border, above two Sevres and bronze mounted frieze drawers and two opposing sham drawers, twelve gilt bronze floral Sevres plaques all around the frieze, above cabriole legs headed by ormolu maidenheads ending in scrolled acanthus bronze cast sabots. Attributed to Biggs of Maidenhead located in Hare Hatch Grange, Nr. Twyford, Berkshire UK. Provenance: Mrs. Robert William Wood, Houston, TX. A fine 19th century French Pollard walnut marquetry and ormolu centre table. The ornate top inlaid in fruitwood with musical trophies. Supported on cabriole legs. 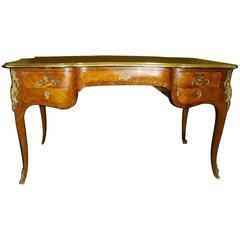 Fine quality 19th century French Louis XV bureau plat. Fine gilt bronze mounts. Original leather top.